This is what happens to you when you're sitting in a cold operating room all day long. My hand looks like it's about 200 years old. The skin is all dry and cracked, occasionally bleeding through the cracks. Not only is the room extremely cold, causing vasoconstriction and poor perfusion of the skin, I'm also very dehydrated. When they made the rules about no food or beverages in the OR's, they didn't take into consideration the people who have to suffer under those rules. But what else is new? We're just here to work and do what we're told. 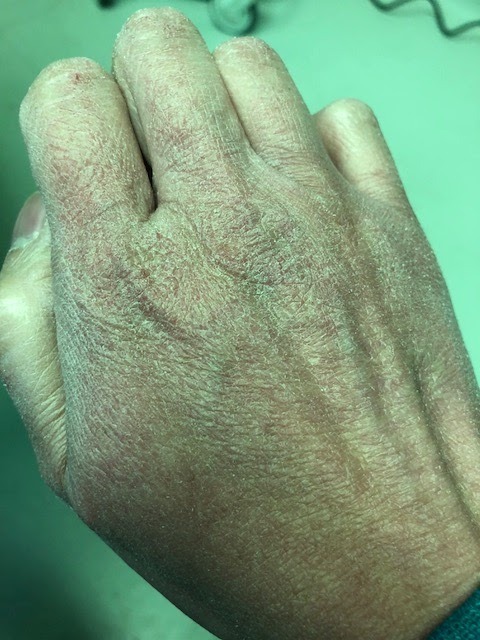 Besides the OR environment, other factors contributing to my advanced skin aging include the constant washing of our hands. The natural skin oils get washed away every time I clean them. Even when I put on skin lotion, it is gone after the next visit to the sink. Then there is the Joint Commission requirement that we have to Purell our hands after every single encounter with a patient. This often leads to Purelling several times an hour. Since Purell is mainly alcohol based, it feels like rubbing ice on my hands each time. Add in the really dry winter air in Los Angeles, which is currently contributing to our epidemic wildfires this season, and what you have is a perfect storm for drying out and mummifying my hands. Would it really be so detrimental for the OR's to raise the room temperatures? Would patients really suffer massive infection complications if we brought a water bottle into the room? Can we ease off on the epidemiology gestapo who surreptitiously monitor our hand washing techniques? Show me proof that all these maneuvers actually contribute to decreasing patient infections and complications. Somehow I suspect there is no such data available. We just keep on doing what we're doing because that's what we were told. I went through years of college and medical school for this?